Welcome to my Sunday Patisserie Challenge. Today is very special day that demands a special kind of sweet treat; it is the feast day of my namesake Saint Jacqueline and despite being born a Catholic, educated in Catholic schools and having lived in France where every calendar and diary sold show the name of the saint of the day, I realised I knew nothing about her. Yesterday curiosity got the better of me and I set off on a Google journey to find out more and the more I found out the more I smiled. Saint Jacqueline was born in 12th Century Rome; she married Gratien Frangipani but was widowed within a few years, she was a good friend of Saint Francis of Assisi and was quite an accomplished baker of almond cakes. These cakes, called Frangipani after her family name, were given to the poor, the unhappy and the rich and also bundled into her little chariot to be handed to the other pilgrims she met on her annual pilgrimage walk to Santiago de Compostela in Spain. I liked her immediately. I’ve always loved frangipani, a sweet almond cream made with ground almonds, butter, sugar and eggs, and since moving here and finding ourselves on one of the Chemin de St Jacques (the way of St James) I have been fascinated by these pilgrim routes through Europe to Santiago de Compostela. I feel no need to go on a pilgrimage, but I would love to walk or cycle this historic route and I can’t think of anything better than a frangipani cake to nourish me along the way. 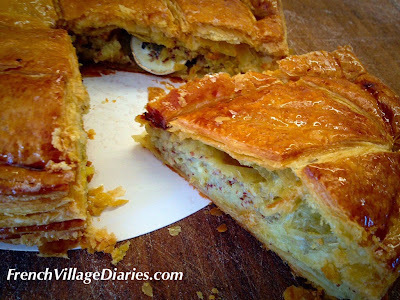 Bernadette at our boulangerie makes use of frangipani in a few recipes, but today she only had one choice for me; a galette with a crisp puff pastry shell, that exploded as I bit into it, with a generous frangipani centre, that was still warm it was so fresh. We may be 33 days away from the 6th January, but our village seems reluctant to forget the galette des rois just yet, however I’m renaming this one the galette de Sainte Jacqueline. It is the perfect comfort food for cold winter days and I’m delighted to be named after the first frangipani cake baker in the world, thanks Mum and Dad. Please come back next Sunday to help me munch my way through my next patisserie. If you missed my previous patisserie challenge posts you can catch up here: Buchette de Noel, Eclair au Chocolat and La Foret Noire.